Who's hungry?! 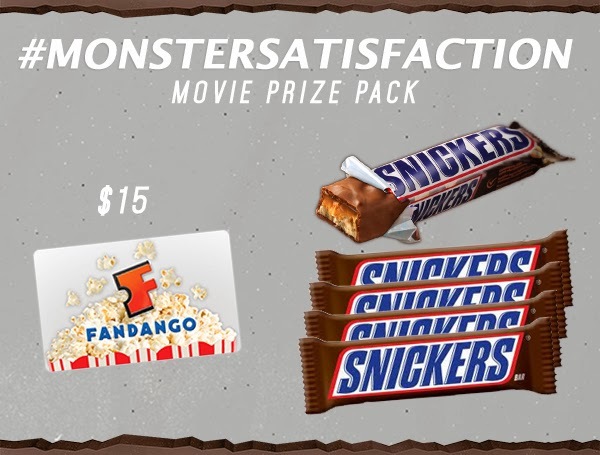 Want to win a $15 Fandango Gift Card and 5 Snickers Bars? If you watched the Oscars last night then you would have undoubtedly seen Snickers Godzilla commercial. What did you think of the commercial? Catch it again here if you missed it! To celebrate the release of the new Snickers “You’re Not You When You’re Hungry” commercial, Snickers wants to hear about your most satisfying movie experience. So tweet with the #MONSTERSATISFACTION hashtag about your favorite monster movie of all time. Comment below with a copy of the link to the tweet below with your full name. US residents only, one entry per person. Contest ends Monday March 17th Midnight ET.